TRAILHEAD ACCESS: Take 1-90 Exit 80 and head north through Roslyn, north on Highway 903 to Lake Cle Elum, north along the lake to Salmon La Sac, then north on FS Road 4330 for 9 miles to the trailhead. PARKING AND FACILITIES: Parking is on the edge of the road or in Scatter Creek camp, on the north side of Scatter Creek Ford. There is adequate parking for 10+ vehicles and a toilet nearby. TRAIL: This steep trail had been abandoned for many years and was put back on the trail system in 1988 and logged out in 1992. It is difficult to find in some places, and is recommended only for hikers seeking a little more challenge in orienteering and solitude. The trail begins at Road 4330, following a high stream bank on the north side of Scatter Creek. After passing through a partially logged area, it is easy to find due to old blazes and a narrow tread. 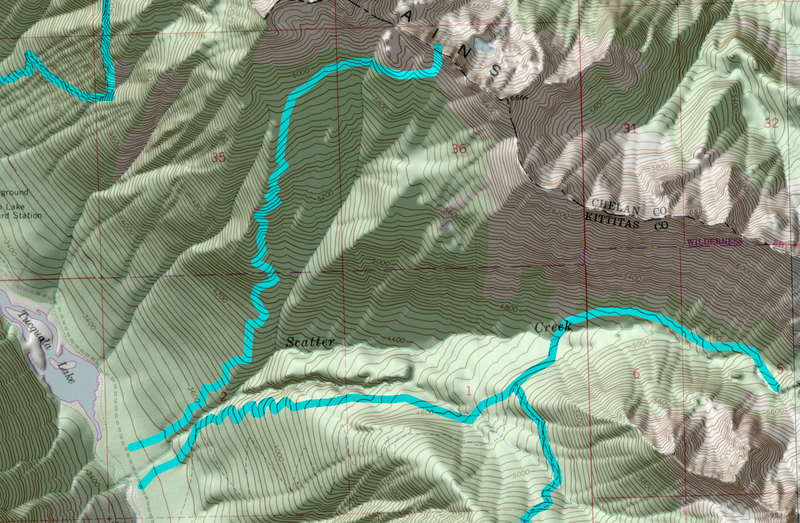 It climbs steeply with numerous short switchbacks, turning away from the creek and climbing into a small high basin 0.5 mile before ending at the divide with Chelan County and Meadow Creek. There is a small stream in this basin. In open areas such as meadows, the trail is hard to find because the tread is faint. The trail was partially blazed in 1989 and 1992. SETTING: Valley bottom, stream, ridgetop, large old-growth trees, open hillsides, meadows, subalpine zone. OPPORTUNITIES: Hiking, pathfinding, scenery, wildlife, camping, photography.